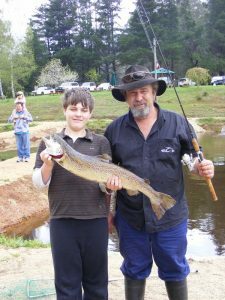 The Alpine Trout Farm at Noojee has been bringing joy to families since 1975 and is located in Gippsland Victoria, and is located approximately 1.5 hours east of Melbourne. The Alpine Trout Farm is opened weekends, public and school holidays to the public to enjoy a day out with the family to catch a trout and cook up on the barbecues or to take home. You can purchase a fresh trout, smoked trout or smoked salmon smoked on site from the retail shop and sit amongst the beautiful surroundings. We supply you with fishing rod, bait, net and bucket free of charge.